* Step 1: Soak the arame in a bowl of cold water for about 30 minutes, then drain and rinse. Meanwhile, put the kuzu and one tablespoon of cold water in a small bowl and stir to form a smooth paste, then set aside. * Step 2: Heat both of the oils in a wok or large frying pan over a high heat. Add the onion and stir-fry for 1 minute, then stir in the garlic and ginger. Add the carrot, pepper and cabbage and stir-fry for two to three minutes. 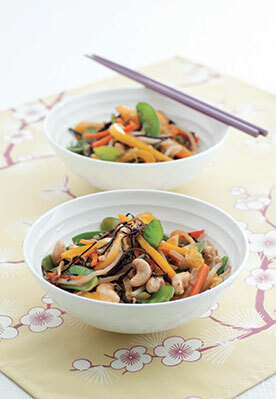 Add the mangetout, bean sprouts and soaked arame and stir-fry for another two minutes. * Step 3: Mix in the tamari, rice wine vinegar and agave syrup, then add the kuzu paste and stock. Cook, stirring, for another two to three minutes until all of the vegetables are cooked but remain quite crunchy. * Step 4: Stir in the cashew nuts. Check the seasoning and add extra tamari if needed. Serve hot.